AMD is all set to release three tiers of AMD Ryzen 7 chips which will feature eight cores and 16 threads on March 2. The cost will be half the price compared to Intel’s high-end processors. Advanced Micro Devices (AMD) is all set to compete with Intel in a bigger way, AMD on Wednesday shared their plans to “hard launch” their Ryzen series of processors on March 2. Guess what? These chips are said to outperform Intel’s bests, and at the same time, the cost will be half the price compared to Intel’s high-end processors. Well, AMD is all set to release three tiers of AMD Ryzen 7 chips which will feature eight cores and 16 threads. The AMD Ryzen 7 1800X will be accessible at $499, and it performs 9% better than Intel Core i7 6900L. The base clock speed will be 3.6Ghz, and the boosted clock speed is 4.0 GHz. The next in the Ryzen series is AMD Ryzen 7 1700X which will be available at $399, and it performs 39% better than Intel Core i7 6800K. The base clock speed will be 3.4Ghz, and the boosted clock speed will be 3.8Ghz. 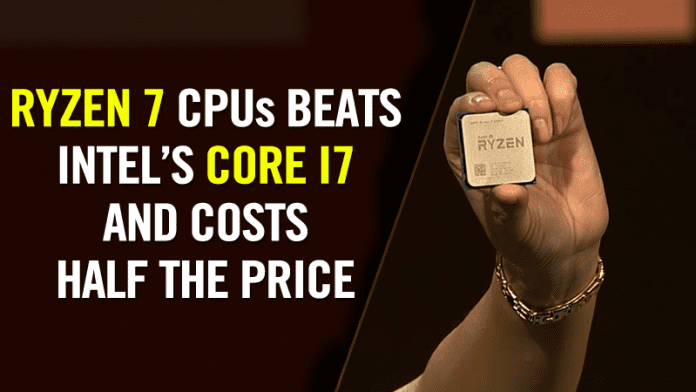 The last at the Ryzen Series is AMD Ryzen 7 1700 which performs 46% better than Intel Core i7 7700K, and it will be available at $329. The base clock speed of the processor will be 3.0 GHz and can be boosted up to 3.7Ghz. Well, the price of the processors is almost 35& – 50% lesser if compared to the Intel’s. The Ryzen series of processors are all set to give tough competition to its competitors. AMD is always known to deliver high performance at lower prices. AMD Ryzen series of processors will be one sale on over 180 different retailers across the world and will be sold individually and in OEM configuration. The pre-order of AMD Ryzen processors are already started and you can grab it from Amazon.